A new intra-crater flank vent opened at the northeastern margin of the summit caldera's floor. This highly interesting event could be a precursor of a new flank eruption. A recent visit to the volcano showed no more (or at least no more significant) activity from the side vent on the lower terrace. The recent lava flows that had surrounded the lips of the inner crater and partially spilled into the central lava lake were seen cooling. The mainly effusive activity from the new secondary vent inside the volcano's caldera continues with little changes. By now, new lava flows have surrounded the central pit (containing the main lava lake), covered most of the lower platform and cascade into the central vent at multiple locations. 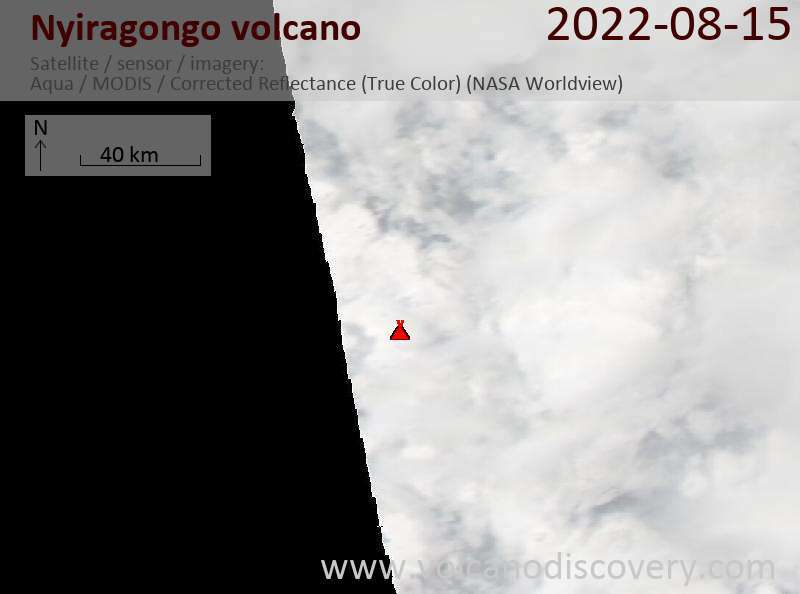 Goma Volcano Observatory published the results of recent field work on the crater of Nyiragongo during 10-11 March in a new report: in summary, it seems that the current intense activity from the two vents inside the inner crater is confined to this area, and no magma has migrated laterally. In other words, the risk of a flank eruption in the near future should be relatively low for the time being. The report expressively mentions that inhabitants of the surrounding villages should not be worried too much about the new activity inside the crater, at least unless something changes significantly. High-precision distance measurements, as far available, show no significant deformation of the volcano's edifice occurred after the opening of the new vent in late February; only a modest extension of 17 mm in NW-SE direction was measured between two fix points on the crater rim between 7 Feb and 2 March, but none since. In addition, no increase in temperature inside the many fissures on the crater and the volcano's flanks has been noted. As to the activity at the new vent itself: when OVG's volcanologists observed it on 10-11 March, it consisted in pulsating lava fountains / strombolian bursts of a few tens of meter height, and the effusion of abundant lava flows that started circumvent the central pit's rims, which are slightly elevated on the lower platform (caused by repeated overflows in the past few years). On 11 March, the first lava from the second vent started to enter and cascade into the central lava lake for the first time. Although no recent images are available from the past days, it is likely that this activity continues with little changes; satellite imagery continue shows a broader zone of heat radiation from the crater. The new vent inside the crater of Nyiragongo remains very active, producing pulsating lava fountains of approx. 30 m height at intervals of 30 seconds, according to the observatory. Well-alimented lava flows leave from the vent. A recent photo (from a visit last week by João Cunha Monteiro) shows that these have now reached the rims of the central lake and started to cascade into it. A great show! A cook who spent the night of 10 March on the rim of the crater reported that the volcano was unusually "noisy". While we have no other specific information, it suggests that the very high level of activity, both from the main lava lake and at the new vent NE of it, first observed on 1 March, continues. Nyiragongo volcano (DR Congo): fracture opens new vent inside crater - precursor of possible flank eruption? Some very unusual and alarming events have been taking place at the volcano recently: A new eruptive vent opened at the northeastern end of the lowest crater terrace, outside the active lava lake (which had been in place since 2002) and just beneath the near vertical crater walls..
GVO reported that since the end of February, activity at the volcano has been more intense than usual. In particular, starting from 04 am on 29 February, local inhabitants began to hear frequent rumblings coming from the volcano almost every minute. Likely, these were caused by the opening of the new dike (fracture occupied as pathway for the new magma) and associated rockfalls inside the crater (the vent is directly located near almost vertical walls). 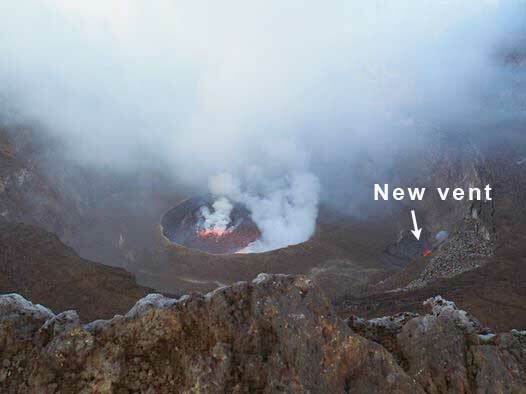 It is important to note as GVO's report mentions, that the location of the new vent is on the east-trending fracture zone that connects the summit vent of Nyiragongo with the prominent flank cone Baruta to the northeast of the main edifice, near the village of Kibumba. This rift zone (along with the southern rift zone extending towards Goma town) is one of the most prone locations of the volcano's dangerous flank eruptions. When these occur, the volcano's edifice is ruptured laterally, allowing magma to drain outside. Such eruptions have been occurring at intervals of few decades typically. They usually drain very large volumes of very fluid, and hence, unusually fast flowing lava from the lake in short time. The results of the past two such eruptions in 1977 and 2002 were catastrophic: they killed more than 1000 people, destroyed dozends of villages and a large part of Goma town (in 2002). 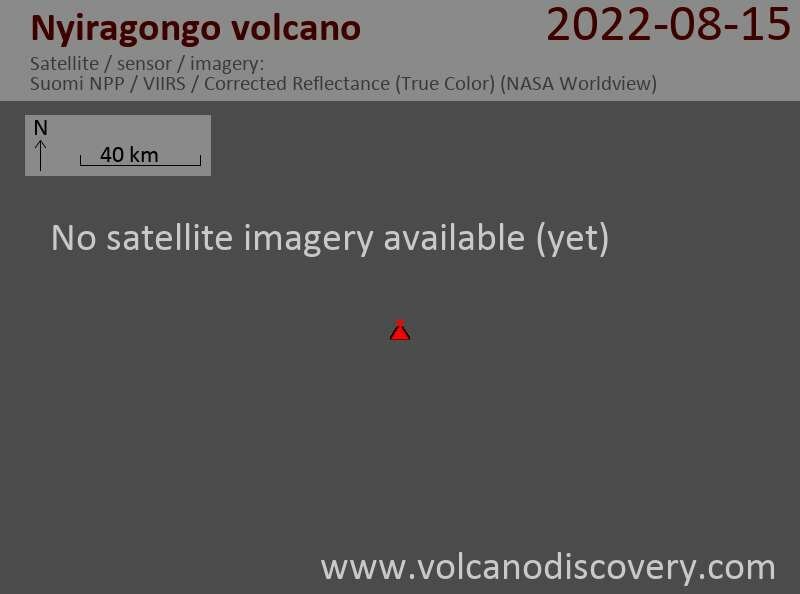 Whether or not the current developments are precursor of a new eruption from Nyiragongo's flanks is difficult to say, but the appearance of the new vent tells that an extensional movement has taken place on this fracture zone, something that is certainly alarming.